Best of the bunch if ordered online in advance. Nice new car. Very efficient pick up. Friendly English speaking staff. 5th time using them. Never been disappointed. Very efficient and straightforward. In the same building but over an internal bridge to the car park area. Extremely effective system and pick up and drop off both fine and pain free. Fantastic car hire company. I've used them quite a few times now and never had a problem. The staff are always friendly and the cars are always spotless inside and seem to always be almost brand new. Highly recommended. At Centauro Rent a Car we offer a wide selection of cars available to hire at Alicante which is renewed yearly. On arrival at Alicante airport please go the Centauro Rent a Car desk in the arrivals hall. Hire a car in Alicante with Centauro Rent a car and enjoy the security and confidence that comes with a fleet of rental cars that is renewed each year. Add to your booking any extras you need when you hire a car, GPS, comprehensive insurance without excess, approved child seats, etc. Get cheap car hire at Alicante airport and drive through the land which guarantees good weather most of the year. 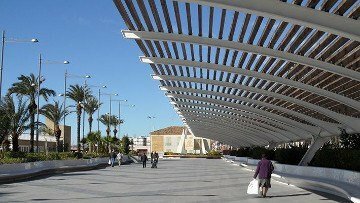 With your car rental in Alicante you can visit landmarks such as the Fortress of Santa Barbara Castle and the Esplanade of Spain, towns with an amazing beauty such as Calpe, Altea or Guadalest and enjoy the many golf courses, the modern technology and tourism fairs and all of its beautiful beaches. To hire a car in Alicante is also the ideal way to experience the famous fiesta, the Bonfires of San Juan, of international tourist interest and to try all the rice dishes in the Costa Blanca from Denia to Santa Pola. Watch out for “arroz de Pinoso” considered to be one of the world’s best quality rice. Alicante is an extraordinary city enjoyed by many travelers. Located on the Mediterranean coast and overlooked by the ‘Benacantil’ mountain where you can find the ‘Santa Bárbara’ castle and the ‘Cara del Moro’ or ‘face of the moor’ one of the most well-known images of the city. Also you will find ‘El Tossal’ and the ‘San Fernando’ castle, both iconic places. Hire a cheap car hire at Alicante airport and you can drive to any of these places in a few minutes. It’s easy to fall in love with this beautiful coastal city, with its wonderful weather, it’s beaches, a variety of sporting activities such as playing golf, numerous watersports are available, amazing mountain ranges with spectacular views where you can also enjoy the many hiking trails, making this one of the most popular tourist destinations not just in Spain and Europe but also in the world. There are many visitors that choose other areas in the province, either to the north e.g. Benidorm, Altea or Alfaz del Pi, or to the south or interior to places such as Torrevieja or Orihuela where they have a second home or holiday home. 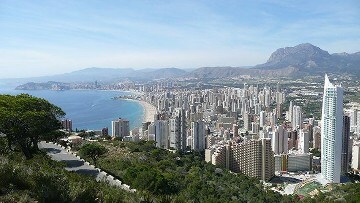 The Alicante region hosts the highest percentage of foreign visitors to Spain. Many of these visitors trust Centauro Rent a Car for their car hire needs and choose our offices at either Alicante airport or Benidorm to enjoy their stay in the region. When you hire a car in Alicante you can visit the Spanish region with the highest number of ‘Blue flags’ (this is a distinction that is awarded every year by the Environmental Education Foundation to recognize the conditions and facilities of beaches and that they also comply with both environmental and installation requirements). There are kilometres of coastline where you can enjoy crystal clear waters, soft, sandy or pebble beaches, marine life and water sport activities. Without a doubt this is why our region is known as “La Millor Terreta del Món”. ‘The best land on Earth’. Don’t miss the beautiful beaches and bay areas of Denia, Calpe, Altea, Albir, Benidorm, Villajoyosa, Campello, Alicante, Santa Pola, Guardamar del Segura or Torrevieja to name but a few. Due the amazing weather In Alicante you can enjoy playing golf the whole year round. With a varied selection of golf courses available either by the sea or near the mountains, golfers can enjoy their favorite pastime. Come and discover a real paradise for Golf lovers with courses such as: Alenda Club de Golf, Alicante Golf, Campo de Golf Villamartín, Club de Golf Bonalba, Club de Golf Don Cayo, Club de Golf El Plantío, Club de Golf Ifach, Club de Golf Javea, Villaitana Wellness Golf & Business Sun Resort, Golf & Country Club La Marquesa, Golf La Finca, La Sella Golf, Las Ramblas de Orihuela, Real Club de Golf Campoamor to name but a few. Here we will give you a selection of the most popular restaurants in the Alicante area and where you discover and enjoy authentic local dishes and other exotic dining options. Don’t miss the chance to enjoy the wide variety or rice dishes, the selection of fresh fish, seafood, delicious stews, meats and local fresh fruit and vegetables. All of this is at your fingertips! Just hire your car and try them out. On leaving Alicante airport with our hire car we are ready to roam and discover the variety that the region has to offer going from north to south. If we start from the north you will find the long beaches of San Juan, a little smaller but with just as much charm you will find Campello, Villajoyosa or Finestrat, continue on and you will reach the most famous tourist destination in the world, Benidorm. Just 10 minutes from Benidorm you can find Terra Mitica, a fun park for all the family to enjoy. But this is not all, if you continue up the coast you can discover some spectacular beaches and beautiful towns with some lovely scenery like Altea, Guadalest, Moraira, Denia or Javea. In any of these areas there is something for everyone to enjoy whether it be the beaches or mountain areas….and this is just the North side. The South has just as much variety. All along this part of the coast you will find amazing beaches and some fantastic Golf courses. We highly recommend that you take some time to visit this area as well and use your car hire to see places such as Torrevieja or Orihuela coast. What are you waiting for? Hire a car and come and see for yourself! At Centauro rent a car we have chosen a selection of routes to help you to enjoy this beautiful region with your car hire. You can choose between the city or the mountain or other areas including the ‘Alto’ or ‘Medio’ Vinalopó, Elche, Benidorm or areas such as Calpe, Denia or Javea.